I finally gave in and installed Truecaller as I wanted to avoid all those annoying telemarketers. I registered with my phone number, enabled blocking of “spammers” and disabled features I didn’t feel like I needed. The next day I received my first notification reminding me something about Truecaller. The day after that again. 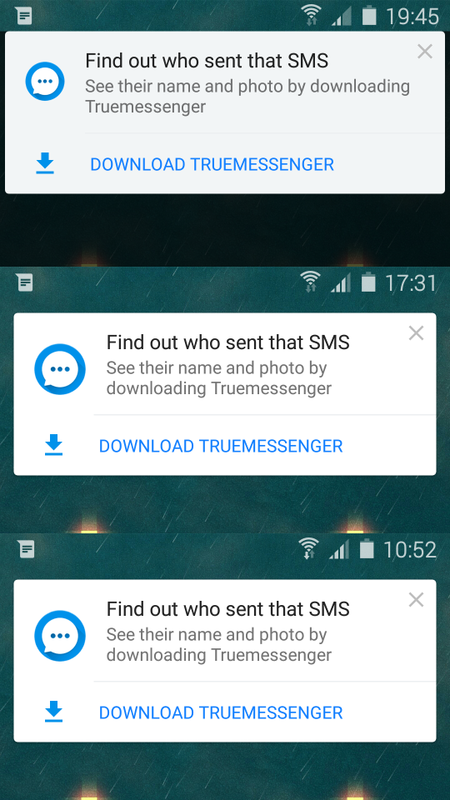 As standard Android notifications were not enough, there was couple of custom popup’s after I received text messages. So Truecaller will spam you 1, 2, 5, 7, 15, and 20 days after installation with various reminders to keep you using the app, installing other Truecaller apps, start using widgets or liking/sharing. "t": "The Smarter Way to Make Calls"
"t": "Truecaller´s widget enables you to reach your super call log directly from your homescreen. Would you like to see how to add the widget?" "t": "We hope you are enjoying your Truecaller experience and want to share it with your friends! Click here to like us!" This is just too much for me. I only have 50 apps installed on my phone but if every app pushed notifications like that, I would go crazy. In the end, it seems like Truecaller is (just) using www.muzutozvednout.cz anyway (at least for some numbers here in Czech Republic). Ok, Truecaller offers “Upgrade to Professional”, but it’s monthly subscription (29 CZK = 1.2 USD per month) and it says “Remove all ads” but doesn’t specify what marketing experiments will I still be part of. I don’t care if I “Get the Pro badge on your profile”. I am now thinking to uninstall it. Will live like there was no True caller at all. Life would be so cool.